An airport is a place where airplanes can land or take off. Most airports in the world have only a long strip of level ground called a runway. Many airports have buildings which are used to hold airplanes and passengers. A building that holds passengers waiting for their planes or luggage is called a terminal. The sections between the plane and the terminal are called "gates". Airports also have buildings called hangars to hold planes when they are not used. Some airports have buildings to control the airport, like a control tower which tells planes where to go. An international airport is a large airport that airplanes can use to fly to and from other countries. A domestic airport is an airport which is usually smaller and only has airplanes coming from places in the same country. 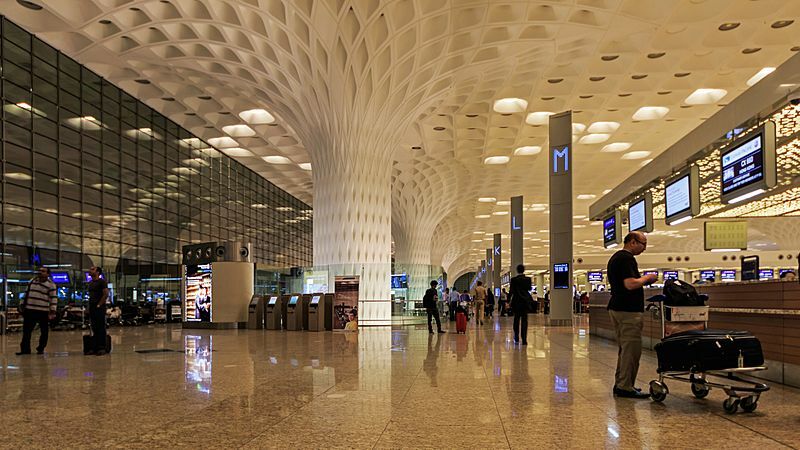 Most international airports have shops and restaurants for airplane passengers to use. An airport used by the military is often called an air force base or airbase. An aircraft carrier is a floating airbase. Airports are made and operated for safety. Today, people must walk through a metal detector, a machine that can tell if metal goes through it. If it makes a noise, the officers will make that person take off all things on them that are metal. They also have X-ray machines that can look into luggage. If officers find items such as weapons, or anything that can be used to kill people, that item (and the person who has it) are taken away and possibly arrested. As well as this, passengers are not allowed to bring bottles or containers with over 100 ml of liquid onto the plane because they could be turned into bombs. Therefore, all water bottles must be emptied before entering the secured area. The Berlin Brandenburg Airport is publicly financed by the states of Berlin and Brandenburg and the Federal Republic of Germany. Recife International Airport in Recife, Brazil. The Kharkiv Airport in Sokolniki, Ukraine (1924). The New Orleans International Airport passenger terminal building in New Orleans (1960s). The Bender Qassim International Airport in Bosaso, Somalia (2007). 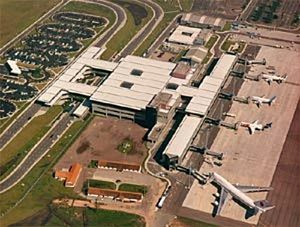 Runway in Congonhas-São Paulo Airport in Brazil. Airport Facts for Kids. Kiddle Encyclopedia.